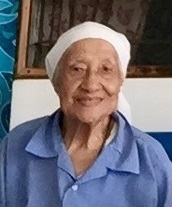 Aleta Vaoheilala, daughter of Simeone Vaoheilala and Meliana Puakavase, was born on 25 May 1928 at Leava, Sigave, Futuna. She was professed as a Missionary Sister of the Society of Mary on 16 July 1956 at Sofala, Wallis and took the name of Sister Malia Atelea. Sister Malia Atelea spent her life of service in the Church and the Congregation in three Pacific islands: Wallis, New Caledonia and her home island of Futuna. After profession in Wallis she spent 8 years as cook in the boarding school at Lano. From 1973 she spent six years in the three SMSM communities of Hihifo, Hahake and Sofala. It must have been a joy for her to celebrate her silver jubilee while missioned in the community of Poi in Futuna, and later to share her knowledge and skills also in Kolopelu and Sausau. Her years in New Caledonia from 1965 to 1972 helped equip her for wider service by learning French, sewing and catechetics. She implemented this last by teaching small children in the parish of Vallée du Tir, strengthened in her smsm vocation by participating in the 1971 Second Novitiate at Mont Mou. Over the years she was involved with people of all ages – for example, with little children in the parish of Vallée du Tir (New Caledonia) where she taught catechism, and later with the little ones in Mala’etoli (Wallis). Malia Atelea gave service to the senior sisters in Notre Dame, Sofala, from 2005 before being missioned to Mua, Logolelei, where, from 2007-2013 she taught a group of widows methods of dyeing material and tapa as well as cooking. Returning to Notre Dame, Sofala in 2014, she continued to help in the community, always with a desire to do and help more. She became weaker but she never complained and was alert and independent until the end. On 3 May 2018 she was hospitalised in the morning with a high fever and infection in her right foot. Bishop Ghislain de Rasilly visited her in the evening while Sisters Nive and Malia Sio were present. Seeing her condition, Bishop gave her the Sacrament of the Sick at 8 pm. She died peacefully on Friday, 4 May at 9 pm with Sister Malia Nive at her side. The peaceful, joyful look on her face spoke much about this humble, hidden Sister who loved her vocation and lived her religious life in simplicity. She was ready to meet her God whom she had always loved and served throughout her life. Malia Atelea was a prayerful woman of great faith. Even when she could barely see she continued to nourish herself daily by reading the Word of God and longed to meet Jesus in the Eucharist. She had a heart full of love and compassion. With a strong character she was truthful and honest in her life and in her relationship with others. She was a woman who knew who she was and was proud to be Marist, Missionary and Religious. In the individual pages written in 2012 before the Congregation moved into the new organisation she wrote of how God and Mary helped her to give her life “with faith, love and truth”. Content in her vocation in life, she was open to the new and what it might mean in the future. And she personalised the words of Jesus: If you want to be a follower of mine, renounce yourself, take up your cross and follow me (Mt. 16:24). This she lived faithfully by her prayer, self-sacrifice and with full confidence in the suffering Christ whom she followed in silence.